My nine-day desert roadtrip wasn't exactly that. It was really a 3-day volleyball tournament in Las Vegas that I happen to surround with three days before and another three days after, my "travel days" while my wife and daughter flew in and out of Sin City. I picked them up at the airport the day prior, drove them to the hotel, to the VB venue and various shopping stops to get things that had been forgotten and watched more estrogen-fueled VB than one man is legally allowed to before Cruel and Unusual Punishment laws come into effect. Ok, it's not all that bad, but only because my daughter is actually playing and one can't help but root for one's gene pool to win. I really feel sorry for those parents that come all this way, only to see their daughter get no play time. 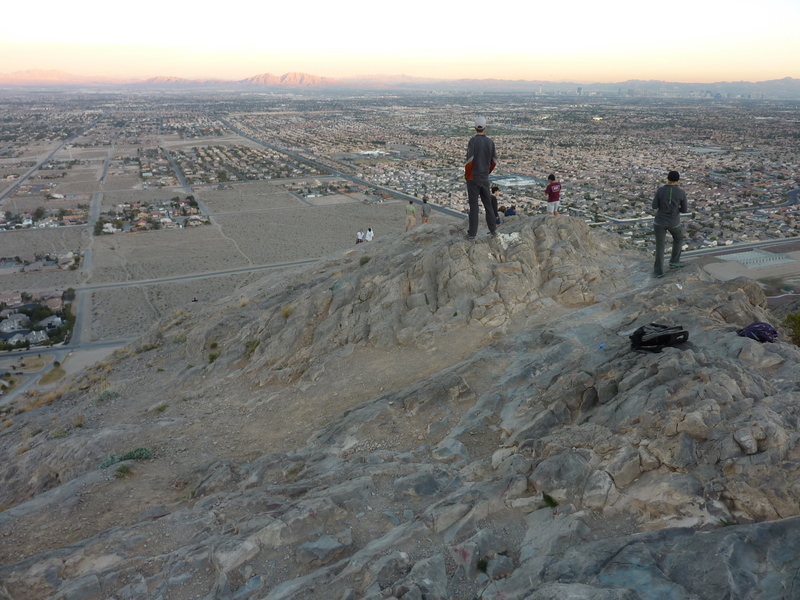 Anyway, it was somewhat difficult to be in Las Vegas and not getting to do what most sane people come to Vegas for - hiking and climbing. With so many fabulous mountains surrounding the glitzy urban cesspool, one can't help but be drawn to them. While I wait in line to use a port-a-potty outside the World Market Center where the games are played, the snowy summits of Mt. Charleston wink at me in the distance. The fantastically colored Red Rocks are closer yet and even more alluring. I drove some folks back to the hotel after the last match and sat around the hotel room with my daughter until she had to run off and join her teammates for dinner around 4p. I could stand it no longer and set out in search of some small mountain to climb. Lone Mountain fit the bill nicely. Located in the NW corner of the suburban sprawl, development has encroached upon this standalone summit on all sides, but left the mountain alone for the most part. My semi-random driving took a wrong turn down Las Vegas Blvd and the heart of The Strip, costing me a 20min delay to go a single mile, subjecting me to the mass of humanity on foot and in their steel chariots, horns blaring, people yelling, lights flashing and hotel-casinos soaring to dizzying heights on either side. In another mood I might have just taken it all in as one of life's unusual experiences, but I was on a mission to get somewhere completely different and thought I was in hell. Or close to it.